Please note that from the date of this News Article for the next 24-48 hours our website will be going through changes and updates. We hope to do this to improve the user experience and add and remove items as per requests and suggestions by users of the website. We apologise in advance in this causes any disruption, however it is unavoidable in our constant need to provide the best of service to Survivors and their family members. If you have any pictures of the above this Survivor would be more then grateful to receive a copy of them. If you can supply details or information please contact Outreach Co-Ordinator, Ann Marie Crean on 1890 200 709. As part of our commitment this year to build on the work done over the course of 2011 there is a short video from Mr. Michael Walsh regarding our upcoming annual report. The annual report is highly anticipated by our members and we hope to release more details regarding its publication as soon as they become available. The report is essential to us to cement the New Right of Place and our change into professionalism. It is our intention that as we build, through trust, respect and active work with Survivors we can become a voice for Survivors going forward. It is imperative that we continue to build on the actual work being done by highlighting this and ensuring that future decisions which are taken that effect Survivors are not done so without their say. The main purpose of the below video is to give Survivors a quick overview of what can be expected to be included in the Annual General report, to re-iterate the benefits of it's publication and to continue to strengthen the link between the organisation and the very people it assists and supports. This will be the first of continuous video and text updates over the coming months from the chairman and the companies staff. It is another avenue being developed to allow for Survivors to receive information. Please feel free to view and comment below to have your question / comment answered and listened to directly by our chairman. Our apologies in advance regarding the quality of the recording and the small amount of background noise within the video. My reason for typing this particular news item is as a result of our commitment to honesty and transparency. Our commitment to ensure that this organisation works for you and your family both now and into the future. This will form part of a wider commitment to allowing Survivors gain the correct information and indeed allow suggestions come from people who may want to air their ideas or ask any question that we can practically answer. We find that often the best ideas are from suggestions that are offered from Survivors but not everybody is comfortable asking the questions, so hopefully this will give you an avenue of anonymity that will allow any person ask questions and offer suggestions that drive the organisation forward. I sincerely hope that any questions you have are asked because every question that allows Survivors receive answers is crucial. Additionally any question that is asked in our office will be added to this section also for everybody to see the answers. Looking forward to your questions and I will hope to have this option open once a month or once every two months. In what was a fantastic suggestion by one of our members, Mr. Desmond Heeney, we have decided to start a book of Condolences for Mary Raftery RIP. As all Survivors are aware Mary Raftery spoke so passionatly and intelligently about Survivors Rights and Entitlements and was the driving force behind recognition for Survivors of this country. It is with this in mind that every Survivor and Supporter should acknowledge the wonderful legagy Mrs. Raftery left us with. As a result we have started in each office in the country a book of condolences for Survivors / Supporters and family members to sign. Our intention is to bring this to Mrs. Rafterys family members to acknowldge the respect and high esteem so many held Mary in. If you cannot get to your local office to sign the book, please leave a short message and your name on this page below and we will add it onto the book for you. Alternatively each of our offices will be open for you to sign your name on Wednesday, Thursday and Friday 10 am - 5 pm. In what can only be described as devestating news we heard of the loss of Mary Raftery this morning. Mrs. Raftery was an insightful, intelligent and passionate advocate who's works really began to highlight the depths of brutality caused in State run Industrial Schools. Through her work on "States of Fear" and the powerful "Suffer the little Children" she helped add weight to what many Survivors had ben saying for quite some time. It was clear to see from her work the passion she held for a generation of innocent women and men and the advancement of Survivors Rights and entitlements are owed as much to her as the many individuals who spoke out against these injustices. Our immediate thoughts are with Mrs. Raftery's family and friends in this difficult time. She was a true visionary and inspiration to a generation of Irish men and women and to us, her legacy will live on. From everybody within Right Of Place Second Chance we would like to extend our warmest congratulations to Sally Mulready on her recent appoitment to President Higgins Council of State. It is fantastic to see that an active campaigner for Civil Rights, Survivors Rights and indeed her tireless work on behalf of Survivors of Magdeline Laundries would be bestowed with such an honour. It is this affirmation of the continued work that you do for some of the most vulnerable within our society both in the UK and Ireland that will ensure the marginalised will not be forgotten. From looking at your work it is clear to see the passion you have and if your carry out your duties with as much conviction, intelligence and compassion for citizens of this country and its diaspora we can all be safe in the knowledge that the marginalised will always have a voice. Finally our sincerest congratulations again and we wish you continued success. For any person wishing to seek a hard copy of the below information please feel free to contact your local office and one will be posted out to you as soon as practical. In addition to this the Board of Directors wish to thank the Survivors who turned up and the many who decided to avail of the discounted room rate (Roughly 50% of all Survivors in attendance). We sincerely hope the meeting was productive and the time you spent in Waterford was enjoyable. We would also again like to re-iterate our thanks to those who raised questions and contributed comments as it is this in a structured and respectful manner that allows Survivors receive the correct information. We were also sorry to have a member resign but were happy that true democracy was allowed to take place and the true reflection of how your new organisation is being received was shown through this democracy and transparency. Finally we thank you for the very encouraging and positive comments and we hope that all of you - Survivor, family member or Friend / Supporter had a fantastic Christmas and a wonderful New Year but we will continue to build on the many positives of 2011 into 2012 for you. The Mayor of Waterford Councillor Pat Hayes, Fiona Long, Owen O Neil Director of Waterford and South Tipperary Community Youth Services, Micheál Walsh, Outreach Co-Ordinator, Waterford & Eastern Region and all members who expressed apologies. Francis Treanor (Area support and Co-ordinatior) (Chairman of AGM). Michael Walsh (Chairman of Board of Directors). Tom Wall (Glin) (Public Relations Officer- PRO). Danny Mc Evoy (Chairman of Waterford & Eastern Region) *Note: Danny Mc Evoy Resigned at This AGM. Francis Treanor chaired the meeting (AGM). The meeting was opened by Francis Treanor who is the Area support co-ordinatior of all the regions in Ireland and the United Kingdom. Mr Treanor welcomed all attending and gave apologies for those who were unable to attend. He also welcomed members of the board of directors and emphasized that the AGM has to be held once a year. There was an interruption from the table from Mr. Mc Evoy to Mr. Treanor. Mr. Treanor politely handled the interruption and continued uninterrupted. Mr Treanor further welcomed all attending outreach officers and supporting staff. Mr Treanor then offered members to ask questions but emphasized that due to time there could only be 3 minutes allocated to each person. The questioning and answering was to be conducted at the meetings conclusion. Mr Treanor then handed over the meeting to Michael Walsh (Chairman of the board). Mr Walsh welcomed all attending and reiterated the fact that the AGM was held for the first time in Waterford City. Future AGM`s will be held in the other regions e.g. Cork, Limerick, Galway each year. Mr Walsh gave apologies for the Mayor of Waterford who was caught up with traffic in Dublin. Mr Walsh then went on to address the floor in relation to the new Right of Place Second Chance (ROPSC). Mr Walsh spoke of how the new ROPSC came into existence and how it is relevant to survivors (SV) and their families. Also what ROPSC is planning for the future. Mr Walsh then spoke of the last eleven months of the experiences of the new ROPSC and of the problems at the start of the new ROPSC. There was much criticism, anger and accusations with claims of missing monies and mismanagement. The new board was formed and the old board retired. He then went on to state what the new ROPSC has so far achieved. ● Support Co-oridinator to quality control work done by outreach officers and report to the board of directors and the HSE. •The employment of three full time outreach workers covering the whole of the country. •The establishment of three new offices in Waterford, Limerick and Galway. •The transforming of the organisation from an amateur to a professional organisation. ● Duty of office staff is to support outreach officers and pass on any queries to the outreach officers. If necessary, the outreach officers will go to the person’s home. ● Our issues are Housing, welfare, health and other social issues. ● There has been a large increase from SV and their family members contacting ROPSC offices in regards the above issues. ● Our Organisation is getting stronger. ● The HSE does quality control on our organisation; they also require a monthly summary of all activities by ROPSC including financial report. ● Francis will shortly be giving a power point slide presentation on all statistics and activities by outreach officers and all supporting staff. I have a message to all SV and their families. “Don’t be afraid to ask!” If you are isolated or are on your own, do not hesitate to ring or contact any of our offices. Also ROPSC is dedicated to meeting and achieving the highest standard of services and supports to all SV and their extended families. It is also our aim to change Government and statutory agencies attitudes toward SV and ROPSC. We will be re-establishing the newsletter next year and will be continuing to do so per hard copy (actual paper) and per e-mail as well as it will be posted on our website. The Limerick office will re-open. We have secured funding for ROPSC. We will be also securing membership for 2012. This will be by fine combing the ROPSC database which will have benefits for all members in regards reductions from businesses. ROPSC and other groups representing SV met with education minister Rurai Quinn in August this year. Francis Treanor and I represented ROPSC at the meeting. ROPSC. We were the only group that were against the trust fund and voted against it. It is understood that in December 2011 that the trust fund was to come into operation. The Government has not included family members in the new trust fund. This ROPSC will fight against. Mr Quinn (and his colleges) had already decided beforehand as to what his intentions were of the fund and how Government was to distribute it long before we met Mr Quinn. A copy of Mr Quinn’s agenda on the fund is available for all to see and download or print on our website on www.rightofplace.com if you do not have access to a computer you can use our offices to gain access and also request a copy. What is the trust fund about? The trust fund is about survivors mainly. What ROPSC is against is the fact that the Government has now excluded family members from accessing this fund. This is being met and challenged by ROPSC. The trust fund is not about monies, but is of essential services of which survivors are rightly and legally entitled to. The question arises whether we should step back from the trust fund or not? Our view and advice is that we as survivors should consider engaging and get the maximum out of it, though it will not be in the form of monies. But that of services. I would like to thank you all for listening and will now hand you over to Francis (Treanor) our area support co-ordinator. Francis Treanor – Area co-ordinater / Chairman of AGM. ● The financial position of the company for the year 2010. Anyone wishing or are interested in looking at the accounts of ROPSC can do so by logging onto www.cro.ie search for Right of Place Second Chance. ● The transitional progress of the apartments in Cork city. These small monies are used to help toward the maintenance of the building. ● There was funding from the HSE (Health Service Executive) and the DOE (Department of Education) in 2010. The vast majority of funding has come from the HSE. Primarily for the expenses and running of the company. Also for the running of all the regional offices in Ireland and the U.K. The departments also recognise the need of expenses for the board of directors for their meetings. ● Welcome house has a yearly cost of 66,000 euros which was reduced to 55,000 euros. Welcome house now is not any more operational. ● Total funding for 2011 was 270,000 – 280,000. ● The structure of the organisation has completely changed and the organisation is transparent. ● The board of directors do not get paid any salary other than their expenses. They are also unpaid volunteers and do a lot of work for the organisation. ● That is a short historical synopsis of the company. ● All organisations have developed commercial strategies which ROPSC will also take on. The board of directors and the outreach staff will undergo continuous training in all areas of welfare, counselling, health, housing and all other associated welfare issues. ● We currently have three offices open in Cork, Galway and Waterford and will be re-opening the Limerick office very soon. The office network deals with many social inclusive issues that many may experience and have experienced. It is essential that all staff have mutual respect for all survivors and their families. ● As from 2012 the organisation has lost support from the department of education. But the HSE will be still supporting the organisation. ● I would like to encourage members to continue supporting our website. ● The outreach officers hand in a monthly report to me of which I then hand to the HSE. We do not report individual personal cases nor give names and addresses of individuals. There is also a recording system in place for the HSE to access and to accounts. ● There will be as from January 2012 computer training for office staff. The organisation has to move on from where we are. Our principal vision is to have a better relationship with the Government and HSE as well as the media. We are a special group of people in society and the Government and media should recognise us as such. ● There must be an understanding between members (survivors) of trust and respect. One of the hardest things in life is to get back trust. If you lose trust than you lose. We must learn to trust and respect one another. We all know what this means when we look back and saw the broken trust by those who should have taken the proper care. ●The recognition of our outreach officers and board of directors as well as the supporting staff. ●We have linked in with many organisations in our communities. And have gained recognition from such organisations. ●Membership does mean something in the organisation especially to the statutory agencies / bodies such as the Garda, HSE, social welfare offices, unemployment exchange, in that we get the message across that we are special people and they show us that respect and dignity. ●The media is also another source we must court and make it our friend not foe. Sadly in the past the media was only too eager to write negatively about the organisation of which some were exaggerated, but this is now being addressed and we are getting better publicity. ●We are a transparent organisation and have nothing to hide, our website is truthful and is updated regularly. Again I say to you that Trust is imperative! All reports can be accessed at our website and also our annual report for 2012 which will be available in February 2012. ● I would like to emphasize that if any member has any issues or problems with the organisation, its outreach officers, its staff they should approach myself (Francis Treanor) if they feel they are not being treated fairly. I have many good testimonials of which I cannot real all of them. But they are from those survivors and families that have been helped greatly by then work of the outreach officers. On example is of a SV whose disability payment was refused, but upon intervention by ROPSC it is being considered and may go ahead. Also another SV was to be evicted and through intervention by ROPSC it was overturned. Another SV was in a mental institution for 20 years, again through intervention he was able to get out of it. Another survivor thanked ROPSC for helping him to live again, he was suicidal. These are only the tip of the iceberg. The outreach workers and their supporting staff are doing a very professional job, more than going the extra mile, some take calls even as late as 10 or later at night as well as weekends. A small number of these can be viewed on our website however this will continue to be updated. This has been a challenging year for the organisation especially during tis current economic climate. It is against such that ROPSC must face. Also we cannot allow the State to ignore us. Truth Justice and Healing is what we will always stand by. I would like to thank the board, the outreach officers, supporting staff and all members attending tonight’s AGM. We will now have a five minute break and will resume our meeting with questions from the floor. I would like to remind members that please keep to the time of three minutes due to the time and that as many as possible will have a chance too to ask questions. (There was a break for five minutes of which the meeting again resumed). Francis Treanor (chairman of AGM) opened the next part of the AGM. He asked the members if they had any questions or any concerns so far. He also asked members, when they ask a question to please stand up and state their name and what area they came from, e.g. the Waterford region. Also to please restrict the time to three minutes. Question from John Connolly, Waterford. Mr. Connolly claimed that he did not know any persons seated at the table except Mr. Walsh. (they being the chairman, the board etc.) Also he claimed that all that was spoken by Mr.Treanor and Mr.Walsh this he did not know either. Mr. Connolly also claimed that all those who were at the table received a salary and that was the main reason as to why they were at the AGM. Mr. Connolly went on to say that the organisation was a fellowship of men women and children of survivors of industrial schools abuse. Mr. Connolly also said that all at the table were in it for their own gain and said “I don’t know who elected you”. Mr.Connolly also claimed he was at a meeting at the tower hotel (he did not say when and who the group were) he was told at that meeting by certain persons ( he did not give names) to vote against the education finance board and to sign to that effect of which he refused to do so. Mr. Connolly then called for a vote of no confidence to the floor. He then apologised if he had insulted anyone. Mr. Treanor (Chairman of AGM) then asked the floor to second Mr. Connolly’s vote of no confidence. Mr. John Williamson (Tipperary) seconded the vote of no confidence (one hand). Mr. Treanor then asked the floor as to who was against the vote of no confidence. The floor responded with overwhelming show of hands against the vote of no confidence. Mr. Treanor thanked Mr. Connolly and Mr. Williamson as well as the floor for their participation in the voting process. Question from Gearldine Mc Carthy ,(Kerry). Ms. Mc Carthy said she was disillusioned over the last few years with the old ROPSC. But praised the new ROPSC and especially the help she got from Ann Marie Crean who is the outreach officer for the Cork and Kerry regions. She thanked the board and all the staff associated with ROPSC. She was delighted with the new committee. Mr. Treanor thanked Geraldine and mentioned that it takes courage to come up and speak. Question from John Williamson, (Tipperary). Mr. Williamson spoke of the assets that ROPSC have and that due to depreciation there must have been a company car that one of the staff owned. Also stated that the previous funding broke down to €8,000 a week. This was in 2009. Also that the current building – current head office and apartments in Cork – was to be handed over to “an individual”. (He did not mention name). Mr. Treanor again mentioned the historical aspects of the old ROPSC. That this was not the case with the new company. There was not no company car and assured Mr. Williamson that no one person in the new organisation was on 8,000 euros a week nor has a company car, and that the building legally belongs to the Cork city council owned by the people of Cork. Also that the building (valued at 1.3 million euros) was held in trust. The building has a 20 year lease and at the end of the lease will be returned to the City of Cork. Mr. Treanor invited Mr. Williamson to check the accounts for himself. Statement from Danny Mc Evoy, chairman of Waterford and south east region. Mr. Mc Evoy stated that it was he who was among the first persons to start up ROPSC. Mr. Mc Evoy then categorically stated “I resign as chairman for the Waterford region”. He then wished everyone a happy Christmas and walked out of the meeting. Mr. John Connolly accompanied Mr. Mc Evoy leaving. Question from Andrew Burke, (Waterford). Mr. Burke asked about the current situation regarding the education finance board (EFB) and will there be still funding for his children? Especially in third level colleges. We know that the EFB finished in October 2011. There is still a small amount of monies left. It depends as to when one puts in an application. If you put it in January then it should be processed, if you put it in December (2011) the chances are not so good. Mr. Treanor explained the legalities and commitment of the Government to keep up the continuity of the fund, and persons who have applied within the allocated time and that there were still monies then they should be met. If a person has started on year1 of a third level course (last year/this year at the start) then the board should commit itself to meeting that application and continue to do so when that person continues into year2 and 3. ROPSC is committed to fighting for such funds for children of survivors as well as family members. ROPSC will also be making submissions to the Government and the trust fund for those who opted out of a redress award. So they too can access the fund. All who qualify for redress should have access to the fund. Question from Noel Dwyer(did nor state area). How much does the Government have in monies? Currently 28 million euros in the form of properties which may or can be used for the trust. Maureen had concerns about the internet and particularly about those survivors who cannot read nor write. She also spoke about the historical ROPSC of the old organisation and where did all the money go? Where did the survivor’s money go? On what on who? An investigation was carried out the “pot of gold” of the old ROPSC and so far no evidence had been produced nor has anyone been convicted. If there is any money out there then please tell us and we will chase it. I have been on the new board of directors for the last 10 months and neither I nor any other of the board get a salary. I get only travel expenses, and like today I have travelled far from Limerick. (*note other board members travel from Galway) I refute anyone that thinks we get a salary. I also want to say that the work the outreach workers do, do more than their paid hours. They are the first contact for many survivors. The new board are not “fat cats” getting large salaries. The new ROPSC have made tremendous strides in building up the new organisation. There is proper accountability, transparency and there is no hidden agenda, which is what I wanted to make clear. Michael Walsh (chairman of board). I would like to also re-iterate what Tom mentioned, in that these allegations of salaries being paid to the board are unfounded. We want to make the new organisation more interactive and include more socialising. I am happy to say that we have secured funding for such worthy purposes. The new ROPSC has taken on many older legacies from the old ROPSC. Francis Treanor (chairman of AGM). (At this stage the meeting had to come to a close due to the time factor and that many had travelled from very afar). I would like to thank all who attended this first AGM of the new ROPSC. I am looking forward to working with all the outreach officers next year. We want to move the organisation around the country over the next few years. I wish all tonight a happy Christmas and New Year and a safe journey to all who have travelled. Patrick Cleary 31st December 2011. Please click on www.wpmd.org to listen to a radio station hosting a show regarding Right Of Place and Institutional abuse. It is our intention to continue to hilight many of the issues Survivors are faced with. 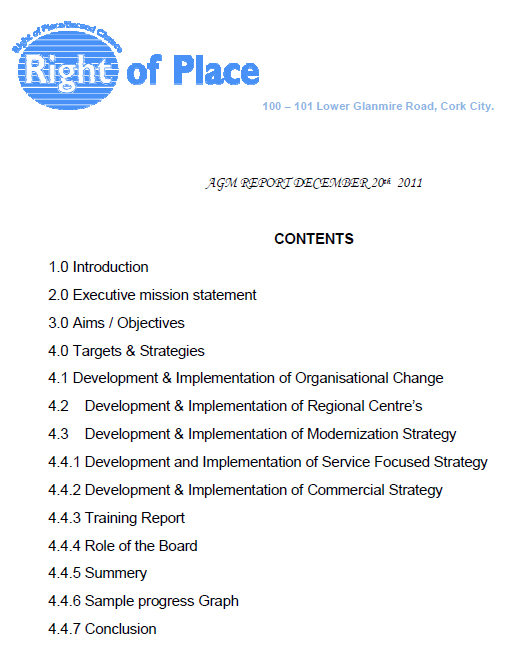 Click here to download the Right Of Place 2011 AGM Report (PDF - 931 KB). Further to our initial discussion regarding the below information Mrs. Niamh Moriarty (researcher) will be in Cork City this coming Friday on the 11th of November. Niamh will be speaking to a number of individuals regarding the below information and if you would like to discuss or talk to Niamh plese feel free to contact her. Please also note that any participant will be compensated for their travel expenses. Survivors views is always appreciated. Any one interested can contact Niamh on any of the numbers below, or call their local office for further information. Best of Luck with your work Niamh and any further assistance please do not hesitate to contact us back. Are you interested in meeting fellow Survivors? Are you interested in having fun? Pat Sheehan who works closely with Right Of Place Second Chance on behalf of the VEC has developed in conjunction with Right Of Place an Art Class for Survivors. It will be run by Marie in St. Johns College every Wednesday. For any body looking for additional information please feel free to contact Pat Sheehan on 086 086 2978 or call one of your local offices. Remember you do not have to be an expert to partake !! Please see below a recent interview that was undertaken in Right Of Place Second Chance offices in Waterford City. The below information helps to highlight the work being done by our offices and also helps to raise awareness of issues that are pertinent to Survivors. We hope information like this, our recent Radio interview and the positive uptake from members of the public will continue so as to ensure Survivors Rights and Entitlements are advanced. Thanks to Mary Ellen Breen for the report. A Previous Resident of Baltimore Fisheries School is interested in organizing a reunion of sorts for any ex - residents of Baltimore Fisheries School. If you have difficulty with the e-mail address, please call the Waterford office on 051 - 309364 and we will be happy to give you Gerrard's personal number to contact him on. Please be advised to keep an eye on our Life Stories section. It will continue to be updated into the future from real life stories from Survivors who we have helped and assisted. We refrain where possible from asking a Survivor or family member to do this, however many want us to publish them onto our website and as a result we are in the process of establishing and developing this. So keep an eye on the Life Stories section, there may be some inspirational stories in there that can highlight the many talents that Survivors have and how with a little support their lives can be advanced.